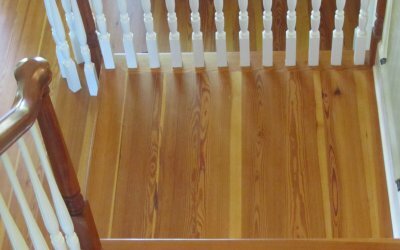 Red Hills Lumber vertical grain heart pine wood creates an even harder flooring surface than other grades of heart pine. It is quarter sawn with grain angles between 45° - 90° forming an elegant pinstripe pattern. Because vertical grain is sawn from the outside layers of a tree, the heart content will vary. Compare the tightness of our naturally grown vertical grained wood with others. Makes beautiful and durable stairing. Vertical grain flooring is available in widths of 2-1/4" to 5-1/4"